How do I add to get a total due on this form? Can you add simple numbers togehter to get a total due on this form? any simple excel formula plug in to total things? I want to add together the comp card and head shots and add shipping to give them a total due. thanks. Hi, unfortunately this isn't possible to create formulas of that standard within our forms as of yet. Please see this thread http://www.jotform.com/answers/123180-Is-there-ability-to-sum-or-multiply-fields-with-variables-and-or-formulas. Also I looked over your form and there is an easier way to accept payments with our Payment Tools Integrations (http://www.jotform.com/help/165-How-to-setup-a-payment-integration-and-customize-it and http://www.jotform.com/help/47-Payment-Forms-Basics) which can be setup to add up the Total and even include shipping within their gateway such as with Paypal. In addition to this information I strongly wouldn't recommend asking for billing or credit card information in this manner you currently have on your form since you've done all this with manually created fields. I would like to advise you not to do so because it will violate our terms of usage and be seen as phishing by our system and that is another reason we've provided Payment Tools for your ease of use to maintain secured sales transactions from your customers. I hope this helps and if you need any further assistance with anything should you have more questions just ask us. I will try to figure out the best way. are you saying you HAVE to use paypal if i use that? We have our own payment machines. Ideally i'd like the secure submission of the credit info, but submit it on our end so we don't have to pay fees twice. also.. is there a limit to the size of files overall that are submitted? I just tested it and you can send very large files which is good. Is there a limit before you start charging concerning the file sizes they send? i didn't realize it wasn't going to be directly emailed into the email itself. Also if you reach 100 submissions in 1 month - is there an alert to purchase? I have no idea how many we will have. As for calculated/total values, -- those on the payment fields are the only fields that offer calculations and gives total values. 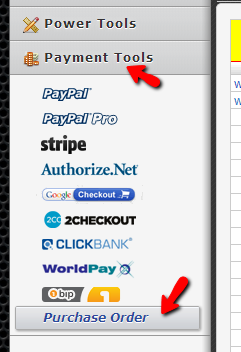 There is one payment field that does not uses any payment gateway like paypal but still calculates. This is the Purchase Order field, found also among the payment tools. Hope this help. Please update us if you have further inquiry. I upgraded to the Premium by the way. 1.in reference to the Purchase order to see the total, can i add in a spot for shipping and handling?
. say.. i want 3 of this product @ $15 each and have that calculate. so they can see a true total? 2. I want this form to go to different email address. how do i direct it to that? Another possible solution is to hide the Submit button using Conditions, until the "shipping and handling" option is selected. If you interested in this option, please let us know, then we will create an example for you. 3. In order for you to set up a different email address other than the primary one , you can set it up by editing your email alert.